Creative opportunity is opened for all who live in connection with the Big River. The watershed is huge reaching to the continental divides – which in turn communicate to both the Arctic Ocean and Gulf of Mexico. As the 2014 – 2024 Columbia River Treaty Review process is underway it seems an important time to look deeply into the history of the River. It has been held in a sacred trust through the Indigenous Legal Orders of the Land for thousands of years. These wisdoms were largely disregarded as the militaristic industrialization of the river began and continues through the colonial process. In the images and videos below, the people – both Settlers and First Peoples, Native Americans, share their perspectives. We have a lot of listening to do in finding the collaborative & restorative process needed. There are big changes coming in order to protect our common health and vitality as we renegotiate our shared values. This map was first published with the Journals of Lewis and Clark – 1814 – 22 years after the first English speaker came into what was named by Gray as the Columbia – the NChi’Wana is the Sahaptan name most used at Celilo for the Big River. The first settler proposal to dam the falls for power was written in the 1830’s. This is the oldest settler image of Celilo Falls – 1849 – we have yet encountered – referred to as the Cascades or Great Falls at this time – also known as Tum-Tum, Tumwater, Horseshoe Falls and the Great Shute. It seems that the image was from memory and may have blended with other memories. This was before the word Celilo came into common usage by English speakers. The first use of the word in reference to the falls in the Oregonian is in the 1890’s – though the term was used in reference to the warehouses which staged the civil war gold rush into Idaho from there during the 1860’s. At that time it was the farthest East commercial river travel was possible – making it the central hub of commerce into the inland West. The worlds largest warehouse, almost a mile long, was built to enable the staging of this commerce. 100’s of settlers took up residence at the falls and claimed land title despite the Aboriginal title and significant use and occupation of the falls by Columbia River Indians over the last 14,000 years. Celilo Village is the longest continuously occupied village site on Turtle Island (North America). This video (mostly silent) includes footage from the 1914 Celilo Canal all the way through the 1957 flooding. This is a 1930’s silent film on life at Celilo Village – from the archives of the Oregon Historical Society. The film discusses the importance of access to the land adjacent to the falls and the river for the proper drying and curing of the fish. This is an issue which still exists with the Army Corp occupying most of the land adjacent to the River and the rail line and I-84 which cut through direct access to the river. This clip is unabashed about building a “Colonial Empire” through “taming” the wild river to export its resources to the rest of the world – it is short but appears to show a black bear fishing at Celilo Falls. This film released in 1949 is a pure piece of propaganda for the military exploitation of the Columbia River. It is preparing the public for the ongoing militarization of the River as apriori Manifest Destiny – now largely viewed as genocidal policy. It exploits the tragedy of the 1948 Vanport flood and the music of Woody Guthrie to make this violation seem an act of kindness to common folk. Woody was paid almost $300 dollars for writing 26 songs in 30 days during 1941. The classics – Roll on Columbia and Pastures of Plenty were among them (Roll on Columbia is the official folk song of Washington State). He seems to have been taken in by the grandness of it all and really missed Indigenous Reality. (Though, in the “lost recordings version” he does have a reference to Phil Sherman’s cold blooded killing of Cascade Chief Tumove ( a signatory of the Willamette Valley Treaty that established Grand Ronde)). Woody’s fellow musicians would later be blacklisted by the US Government for their anti fascist pro people socialism and wild success with Pete Seeger and the Weavers, which were erroneously viewed as a threat to the people of the United States. All copies of the film were ordered to be incinerated soon after release when a former Oregon governor was appointed head of the Dept. of Interior – a janitor took it upon himself to save a copy. 2001 University of Oregon Documentary – Roll on Columbia, Roll On -Woody Guthrie and the BPA about these songs… Pete Seeger, Arlo Guthrie and others. Includes a visit to Celilo and links an image of Celilo Falls with his line about the sacrifices made. This is an amazingly intimate view of the last First Salmon Ceremony in 1956 before the inundation of the falls in 1957. The Oregon Historical Society worked hard to provide Chief Tommy Thompson with venues to share the Columbia River Indians perspective in the lead up to the flooding of the falls. A growing movement to comprehend these ceremonies from the perspective of ecological technology, and Indigenous Legal Orders is developing. The State has marginalized such social technologies by classifying them as religions. The continuation of these ceremonies, and their value systems are informing where the future, as understood through science, needs to realign with the experience and wisdom of ancient knowledge. The day the senate mourned the 50th Anniversary of the ongoing flooding of Celilo Falls. It is clear that this could not have been done today. What is not yet clear is how it is to be undone. Lowering Lake Celilo is a first possible step. This may contain the only known recording of the sound of Wyam… a sound which could be heard from well over a mile away… It is said that there are some who could not sleep for years after the falls were silenced – as the lives of a people have centered on the sounds of falling waters. Powerful reflections on the change of Celilo by Ed Edmo, Linda George Meanus and others in this film. Brigette Whipple-Scott, Warm Springs tribal member, shares items similar to those used for trading at Celilo Falls prior to the construction of hydroelectric dams on the Columbia River. A wonderful oral history of Celilo as shared with slides by Chuck Williams – (Cascade / Chinook – Chuck is the great great grandson of Chief Tumove whose murder is referred to in Woody’s song Roll on Columbia – and has been tireless in working to protect the Columbia Gorge), Tom Robinson (Oregon Historical Society – Tom is a Celilo Falls Scholar / Photo Archivist and has conserved and shared historic images and stories of Celilo Falls throughout the region) & Linda George Meanus (Wyam – Linda is the great granddaughter of Chief Tommy Thompson and is a leader & keeper of Columbia River Indian culture ) hosted by McMenamims History Series. A film which outlines some of the history of the 1961 Canadian / USA Columbia River Treaty which established the Canadian Dams used to control river flow – and the changing understanding and values which need to inform participation in the 2014 – 2024 Treaty Review Process. You get to meet some of the folks who meet on Thursdays and decide how they will change the Rivers flows each Saturday of the year. There is a lot that is being negotiated by this group. While hydro power has often been touted as carbon neutral, new research shows that the methane emissions from dams world wide (due to sediment build up) is greater than greenhouse gas contributions of the worlds entire transportation systems. We must transition to more carbon neutral – ecologically non destructive systems of inhabitation and power generation. Our very survival is at stake. It is the time of undoing past over enthusiasms. Here is a link to an article on this issue. And here is another. Both using peer reviewed science on the matter. The late Elmer Crow is eloquent in the film, DamNation, in representing the significance of a living Columbia River and the deep significance of Celilo Falls. He carries a memory, recorded in the film, which is rapidly disappearing. The film illustrates the wild success of immediate salmon recovery associated with dam removals in Cascadia. The full film is viewable on Netflix. Changes in management are coming. Positive changes would include: allowing for a faster moving river to keep it cooler, a necessity if salmon are to continue; a river allowed to flood in wetlands so that smolts can rest and strengthen on the way to the sea (which will require removing some wetland infilled developments); suspended subsidized barge traffic above the Dalles; redoubled controls to end all pollutions into the waters from agricultural, industry, & the military and repair legacy pollutions; a restoration of Celilo Falls and return to stewardship by the Columbia River Indians & Mid Columbia Treaty Tribes – as the central cultural , spiritual, ecological & economic center that it is (the dam does not have to be removed to begin this process – it can generate power with a lowered head); a stepped transition plan to recover all traditional treaty law fishing sites through dam removals; and finally fish passage for every dam that stands until it has been removed (CRTFC, the 35 affected Tribal & First Nations & a team of biologists have a plan). Central heart of the Columbia River Basin from space – Courtesy of NASA – It actually goes farther into British Columbia, Alberta, Montana, Wyoming, Utah, Nevada and Oregon than pictured here. Celilo is located where the green meets the brown – communicating between ecosystems. 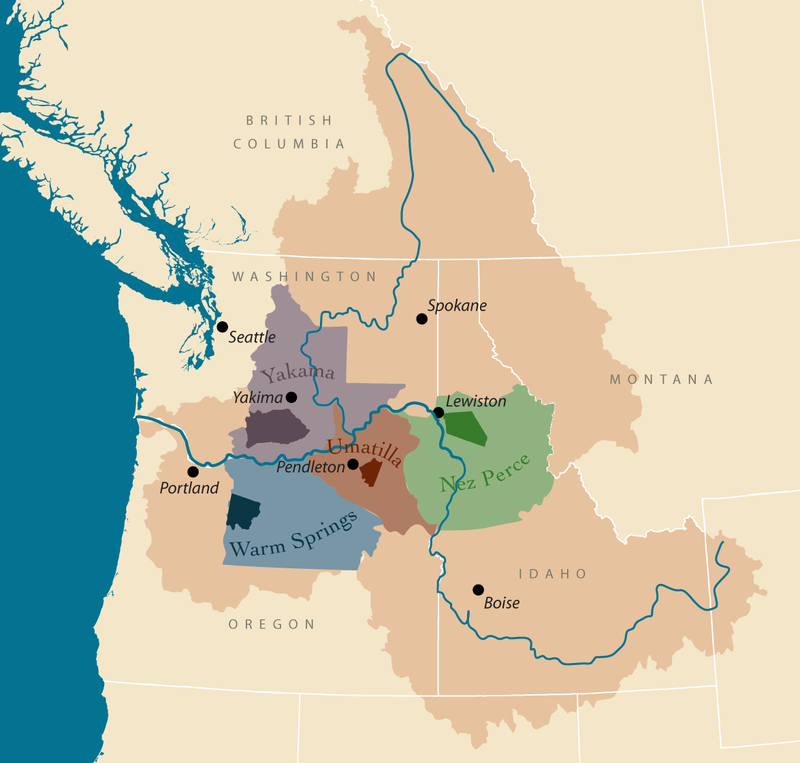 These are the ceded lands of the Columbia River Treaty Tribes who all share historic fishing rights at Celilo Falls on the Mid Columbia – and who hold implicit senior water rights in the heart of the Columbia River Watershed. Not all Columbia River Indians view themselves as having been represented in these land cessions and retain aboriginal title by international law. Treaty Tribes are at the table with Canada and the United States in the 2014-2024 Columbia River Treaty Review process. Map from CRITFC. Thanks to the Friends of Celilo Falls YouTube feed for the great archive of Celilo related video (there are more!) – and for promoting conversations & vision towards the return of Celilo Falls!